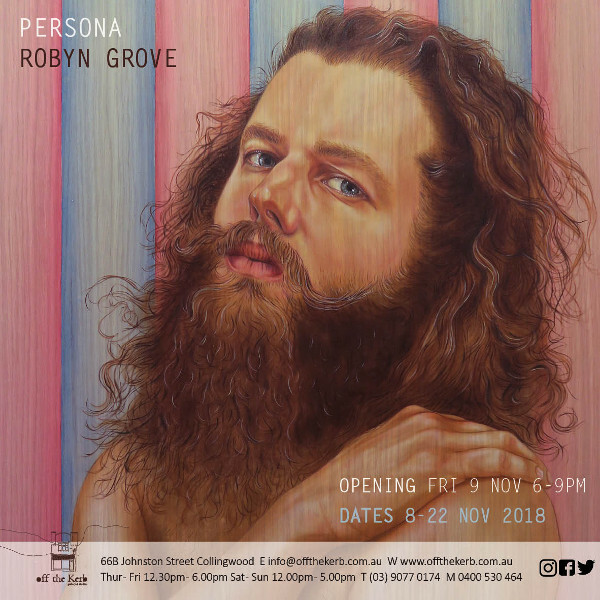 Robyn is part of an exciting lineup of local and international artists at Australia's leading street art event, Wall to Wall Festival, 5-7 April, 2017 in Benalla, north-east Victoria. The theory of “persona” coined by Carl Jung examines discrepancies between our public and private personalities. This theme has featured repeatedly throughout my favourite films: Ingmar Bergman’s “Persona”, David Lynch’s “Mulholland Drive", “Fight Club” by David Fincher and also Reg Cribb’s riveting play “The Haunting of Daniel Gartrell”. It is also poignantly evident in the on-stage versus private lives of the performers I’ve met through Melbourne’s vibrant life-drawing community at Dr Sketchy’s Anti-Art School and Gay Life Drawing. “Persona” strips these local performers of their outlandish, vibrant and powerful on-stage characters, and examines who they are when the costumes are removed, the props set aside and the lights are down. Excerpt: "Describing herself as a modern-day Renaissance painter, Robyn paints portraits that aim to capture the deep, intimate characteristics of her sitters. To accomplish this she goes through a process of getting to know them both in terms of their personality and how they view the world. Mostly working with oils, Robyn prefers handmade Michael Harding oils and mediums. She does a lot of research regarding the chemical backgrounds of her surfaces, prep materials, paints, mediums and varnishes and aims to be as archival as possible. 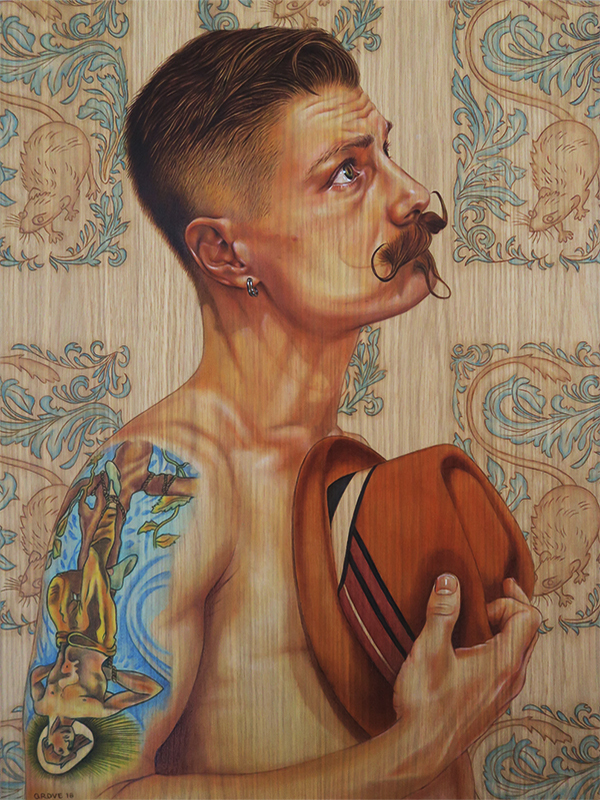 For the current show, Robyn uses handmade American oak with carefully selected grain patterns to suit the works. The Persona Exhibition will consist of five large portraits and five small pieces. The subjects in this, her first solo exhibition, are performers from a variety of disciplines including burlesque, cabaret, dance, voice, magic, sideshow, circus, drag and more." Excerpt: "Contemporary figurative artist Robyn Grove has chosen Japanese artist Jun Inoue as her muse and uses Michael Harding oil paints and mediums in this piece. Robyn has had a long-standing love affair with Japan, as many things about the culture inspire her, particularly calligraphy and ikebana. Furthermore the Japanese arts influence Robyn's own work including her use of decorative patterned backgrounds. Robyn appreciates the formality and the beauty of Japanese art which looks so natural and spontaneous even though it's actually produced from deep contemplation and meditation, and has combined these qualities in her portrait of Jun - he's still and dignified, honest and open, while the contrasting background references his dynamic and fluid style of mural painting." 20+ year career in design, marketing and advertising as Art Director, Designer and Studio Manager. Includes: designs and concepts, digital retouching, illustration, web design and development, marketing, writing and editing copy.